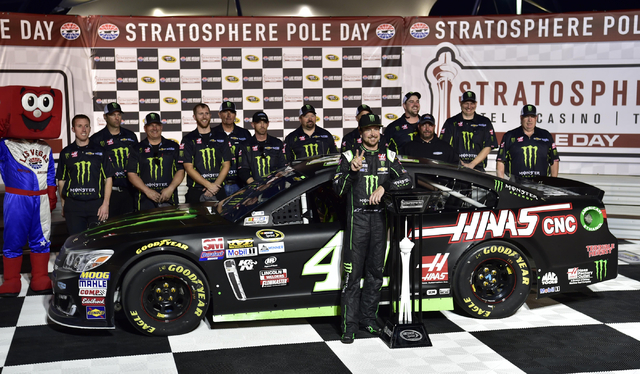 Las Vegan Kurt Busch won the pole position on Friday for Sunday’s Kobalt 400 at Las Vegas Motor Speedway. 1. (41) Kurt Busch, Chevrolet, 196.328 mph. 2. (22) Joey Logano, Ford, 195.851. 3. (20) Matt Kenseth, Toyota, 195.780. 4. (2) Brad Keselowski, Ford, 195.666. 5. (3) Austin Dillon, Chevrolet, 195.624. 6. (4) Kevin Harvick, Chevrolet, 195.454. 7. (43) Aric Almirola, Ford, 195.291. 8. (5) Kasey Kahne, Chevrolet, 195.284. 9. (11) Denny Hamlin, Toyota, 195.080. 10. (78) Martin Truex Jr., Toyota, 194.974. 11. (48) Jimmie Johnson, Chevrolet, 193.986. 12. (47) A.J. Allmendinger, Chevrolet, 193.126. 13. (24) Chase Elliott, Chevrolet, 194.665. 14. (21) Ryan Blaney, Ford, 194.658. 15. (27) Paul Menard, Chevrolet, 194.356. 16. (17) Ricky Stenhouse Jr., Ford, 194.301. 17. (42) Kyle Larson, Chevrolet, 193.889. 18. (10) Danica Patrick, Chevrolet, 193.625. 19. (14) Brian Vickers, Chevrolet, 193.597. 20. (88) Dale Earnhardt Jr., Chevrolet, 193.444. 21. (31) Ryan Newman, Chevrolet, 193.334. 22. (13) Casey Mears, Chevrolet, 192.933. 23. (18) Kyle Busch, Toyota, 192.795. 24. (19) Carl Edwards, Toyota, 195.101. 25. (34) Chris Buescher, Ford, 193.050. 26. (16) Greg Biffle, Ford, 192.933. 27. (38) Landon Cassill, Ford, 192.754. 28. (6) Trevor Bayne, Ford, 192.726. 29. (1) Jamie McMurray, Chevrolet, 192.342. 30. (95) Michael McDowell, Chevrolet, 192.020. 31. (23) David Ragan, Toyota, 191.870. 32. (44) Brian Scott, Ford, 191.144. 33. (7) Regan Smith, Chevrolet, 190.873. 34. (83) Matt DiBenedetto, Toyota, 190.154. 35. (15) Clint Bowyer, Chevrolet, 189.036. 36. (98) Cole Whitt, Chevrolet, 188.422. 37. (46) Michael Annett, Chevrolet, 188.409. 38. (32) Jeffrey Earnhardt, Ford, 187.846. 39. (30) Josh Wise, Chevrolet, 185.810.